You may not find many interesting things to see when glaring into a chicken’s eye, but after closely studying its retina researchers at Washington University have come across a most fascinating discovery. It seems chicken eyes bear a never before seen state of matter in biology, an arrangement of particles that is both ordered and disordered – neither crystal, nor liquid. 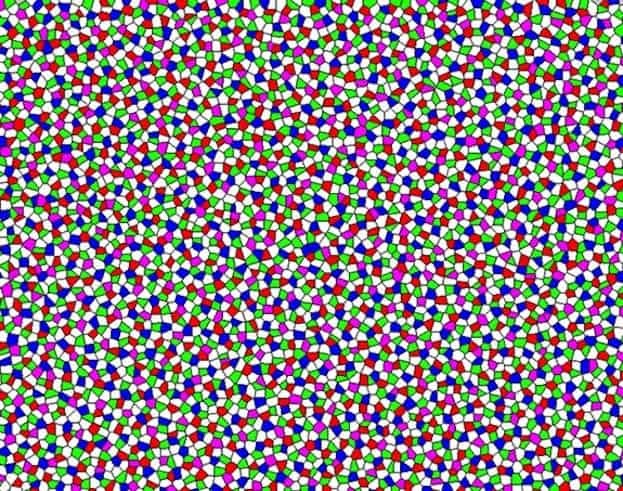 This state is called “disordered hyperuniformity” and could only previously be found in non-biological systems , like liquid helium or simple plasmas. Typically, the retina is comprised of several layers, but only the cones and rods are photosensitive allowing us to see and visually sense our surroundings. In the eye of a chicken, like many other bird species, the retina is comprised of five different types of cones – violet, blue, green and red, while the fifth is responsible for sensing light level variance. Most importantly, however, each type of cone is of a different size. Most animal species have their cones arranged around an orderly pattern. Insects for instance have their cones arranged in a hexagon pattern. Those of a chicken, however, seem to be in complete disarray. At first, if one didn’t know better, you might think that they shouldn’t be able to see anything. Upon closer inspection, the shroud was lifted and most peculiar discovery was made. After making a computer model, the scientists found that the arrangement of chicken cones is particularly tidy. Each cone has a so-called exclusion area that blocks other cones of the same type from straying too close, but this means each individual cone has its own uniform arrangement. At the same time, the five different patterns of the five different cone types are layered on top of each other in a disorderly way as opposed to the orderly structure found in other species’ eyes. Simply put, systems like the arrangement of chicken cones or liquid helium act both at the same time like crystals, keeping the density of particles consistent across large volumes, and liquids, having the same physical properties in all directions. This is the first time, however, that disordered hyperuniformity has been observed in a biological system. Their findings were detailed on Feb. 24 in the journal Physical Review E.